Looking for a natural way to soothe your kids and help them sleep through the night? Weighted blankets are recommended by therapists to help kids relax while the world around them feels too much. What are weighted blankets and what can they do for your child? Here is the complete guide to the best weighted blankets for kids. Looking to join in on the fun? We also have a guide on sizing and buying weighted blankets for adults! What Is a “Kids Weighted Blanket? The heavy feel of a weighted blanket creates a feeling of being hugged or held, which is a strategy used by therapists and occupational therapists in helping to calm kids who are feeling overwhelmed due to issues like ADHD, anxiety, autism, obsessive compulsive disorder (OCD), or post-traumatic stress disorder (PTSD). The hugging or holding sensation helps encourage the release of serotonin in the brain. When a child wears the blanket, the serotonin release helps aid their nervous system in calming them down during an episode of anxiety or stress. Although weighted blankets are an occupational tool, many now look like a normal blanket or comforter. They’re available in many different sizes, weights, and materials and can be found online, in your therapist’s office, or on manufacturers’ websites. Why Should I Buy a Weighted Blanket for My Child? Weighted blankets apply deep touch pressure (DTP) at home. DTP, which is also known as Deep Pressure Therapy, is a strategy used by occupational therapists to help calm patients. It’s a safe and natural way to relax during periods of high stress. In 2011, the Journal of Medical and Biological Engineering published a study that found the effects of Deep Touch Pressure corresponded to lower effect physiological effects of stress. Participants heart rate, blood pressure, and symptoms of anxiety were all lower after using a weighted blanket, which shows that Deep Pressure Therapy has a real effect on the nervous system. Most studies looking at the effects of weighted blankets have been performed on adults. While teenagers and adults can use weighted blankets unsupervised, it’s important for parents to be more scrupulous when using weighted blankets on children under 12 to make the sure blanket isn’t too heavy. Additionally, children using weighted blankets should be supervised to make sure they don’t roll up in a blanket that is too heavy for them and find themselves struggling to breathe. The best weighted blanket for kids will weigh approximately 10% of their ideal body weight. Children aged between 2 and 6 years old are best suited with a 5-pound blanket, particularly if their body weight is between 30 and 40 pounds. Kids aged 7-10 will find a 7-pound blanket works well. Pre-teens (11-13) can safely use a 10-pound blanket. While these are guidelines to finding a decent blanket for kids, be sure to consider the child’s personal preferences. Some children prefer lighter blankets and may find 7-pounds to be too heavy while others may respond best to a slightly heavier blanket. Additionally, it is helpful to find a blanket in a fabric the child likes. From cotton to chenille, there are plenty of available options, so be sure to choose one the wearer finds soothing. Finally, blankets come in different sizes. Some blankets are suitable for sleeping with while others may be smaller versions like lap blankets. Larger blankets tend to be heavier, so be sure to stick to something suitable for a child’s body weight, even if they have a large bed. Here, we’ve chosen a few of our favorite products out there and highlighted all the specifics for you. Harkala’s weighted blanket is designed for kids who struggle to get to sleep, potentially as a result of anxiety, autism or ADHD. It comes in a kid-friendly blue and green color and is made from Harkala’s Minky fabric. Another feature of the fabric is the double-sided sensory aids. One side is smooth and soft, perfect for relaxing, but the other side features the Minky dotted fabric including dots designed for kids who need to fidget with something to relax. The blanket is available as a 5- or 7-pound blanket and is the perfect size to sleep under at night or cuddle with during the day. As a bonus, Harkala donates % of all sales to the University of Washington Autism Clinic, which works to meet the needs of both autistic children and adults. 100% Machine-washable. A favorite swag bag gift at the 2019 pre-Oscar's GBK gifting lounge. Huggaroo designs and manufactures premium comfort and wellness products for children and adults. Designed by perfectionists in Nashville, TN. Committed to outstanding quality and service. Not all weighted blankets are full-size comforter style blankets. This ReachTherapy lap pad is a smaller version of a weighted blanket at 18” x 21”, which makes it great for use at home on the couch or even at school when things get tough. ReachTherapy’s lap pad is available as a 3- or 5-pound blanket at the 18” x 21” size, but it can also be purchased as a 10-pound blanket at 36” x 60”. These blankets are also different from other available kids blankets in the number of styles offered. From sports to astronauts to pandas to glow-in-the-dark styles, kids can choose from 24 patterns that transform their weighted blanket from an essential therapy tool to a cool accessory they can bring anywhere. The blankets are weighted with high density poly pellets, which can be heated or cooled for additional sensory elements. (Never put the blanket in the microwave or the oven.) The pellets are held in place with a middle seam to keep the weight evenly distributed, and the outside cover is a super soft cotton flannel with a Minky underside. The whole lap pad is suitable for machine wash and dry. 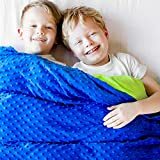 EASY TO WASH & DRY With our 2-piece duvet style removable cover, this children's weighted blanket makes it easy to remove the top layer to wash & dry at home. Weighted blanket soft through washing, making this a truly premium weighted blanket. LIFETIME GUARANTEE We think we have the best weighted blankets for kids on the market. But we know it's not for everyone. That's why unless you are 100% satisfied with your child's weighted blanket, we aren't satisfied either. GREAT FOR SENSORY INPUT Not only is the compression comforting, but the soft plush minky fabric is also a great input. We've even added dots on top for extra sensory input. It's a great sensory blanket for seekers. THE SENSE OF CALM YOUR KID HAS BEEN LOOKING FOR Our sensory blanket is great for the bed or the classroom. This is a great choice to help your child. The Huggaroo weighted blanket is designed for young children whose body weight is between 40 and 80 pounds, but teenagers who want a smaller, lightweight blanket can also benefit from its use as well. The Huggaroo is designed to help children get to sleep and stay asleep. Its dimensions are 36” x 48” and it weighs 6.5 pounds, making it the ideal size for 4 to 11-year-olds. The cover is made of a soft, snuggly chenille and the blanket itself is a cotton fabric. Both are machine washable, but it’s better to avoid the tumble dry and let them air dry instead. What makes the Huggaroo different from other weighted blankets is in its design; it doesn’t immediately appear to be a therapy blanket. Instead, it appears to be a child-size chenille throw. It also comes in two pieces – the weighted piece and a cover – and the two pieces are tied together in six places. While this may appear to be extra work, it’s actually an ingenious design feature to keep the blanket in place. This feature could come in handy for children who move in their sleep or if the blanket is being used during a tantrum or fit because the weight will stay in place regardless of any kicking or flailing. Huggaroo also donates 2% of its profits to One Simple Wish. One Simple Wish is a non-profit organization that grants foster children’s wishes like toys, bikes, shoes, and school supplies.